This is the gorgeous view from my window for the next few weeks! I’m at Green Mountain at Fox Run retreat in the snowy mountains of Vermont. Late last summer, I was exploring support options for working on my binge eating shiz and plotting a way forward from decades of dieting. I wasn’t finding anything that resonated, until my client Rebecca Scritchfield reminded me of Green Mountain. Many of my blogging pals have visited over the years. 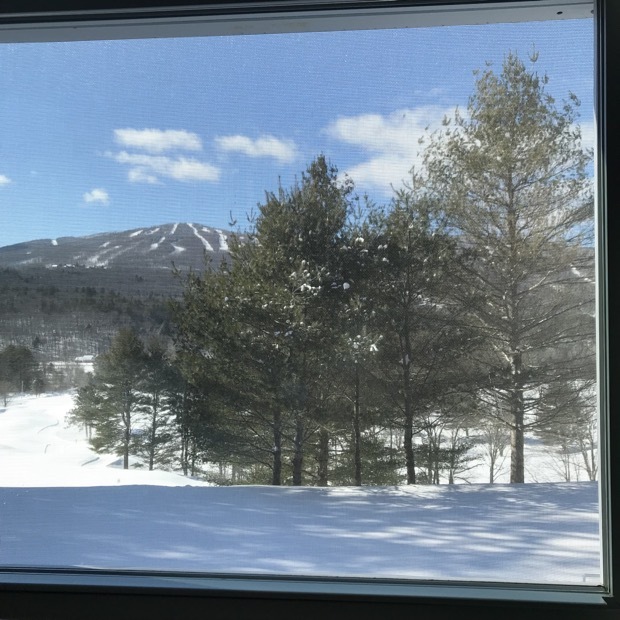 Green Mountain has a mindful, non-diet, evidence-based, practical and compassionate approach, plus the fact they’ve been around for over 40 years really sang to me. So I approached them to see if they might be interested in working together. A gazillion emails later, I’m finally here and I’ll be writing about my experience. I’m doing their Pathway program for binge and emotional eating, as well as their core program. Today is Day One. I’m excited and curious, yet a wee bit terrified to talk about this stuff again. And wondering if I’m bonkers to have bought a plane ticket and abandoned Ziggy for three weeks. That cat will be livid when I get home. Yet I’ve been on this treadmill for so many freakin’ YEARS, I felt compelled to do something wildly different. I’m also nervous as it’s the first time I’ve done any kind of partnership thing in nearly 18 years of blogging. To have worked up the nerve to approach the Green Mountain folks hopefully indicates how big of a deal this. So I’m here with an open mind and ready embrace everything they have to offer. If I walk away with even one more tiny piece of this puzzle in place, it will be a fabulous win. Stay tuned here and on Instagram for snowy updates! Wonderful! I desperately wanted to go there when I was miserable about bingeing. I never went, but it seems amazing. One thing I will say is that I thought for 20 years that I had a problem with binge eating and emotional eating. After therapy and other work, I finally realized that both behaviors stopped when I stopped dieting or attempting to diet. Many many good wishes, Shauna. You always impress me with your courage and your honesty about just.how.freakin.hard bits of life are sometimes. Binge and emotional eating are such delicate topics – I commend you for being so open about it. Green Mountain looks awesome, too…very much enjoying the view through the pixels of my laptop screen. Wishing you the best, and thank you so much for your willingness to share your journey here. As someone who struggles with an eating disorder that has some binge eating elements it is so very helpful to know that I’m not alone. But yes. Hide your delicates or they will get cat pee all over. Just sayin. Good luck Shauna! I hope this works out for you. Good luck girlie. I’m so glad you’re doing this – for my sake, so I can benefit from your experience!